As a result, the Rohingya are a population of nearly 1 million people without civil and human rights. They are not allowed to marry or to enrol in higher education. Without citizenship, they are also banned from travelling. Because of this, when conflict broke out between the Rohingya in the Rakhine state, where most of Myanmar’s Rohingya reside, the Rohingya were trapped and unable to legally escape Rakhine. Many apparently crossed the jungle barefoot with children in their arms to get to the coast and sail to Bangladesh. Even worse, Myanmar’s security forces took sides in this sectarian conflict and raped and tortured many Rohingyas, highlighting the deeply rooted hostility much of Myanmar’s population has towards the Rohingya. How is something like this happening in 2014? How could a population of approximately 1 million people be so obviously deprived of basic human rights, and is anyone doing anything to stop it? In February 2014, Medecins Sans Frontieres (MSF), the world’s leading humanitarian organization providing healthcare, was banned from Myanmar after protesters claimed they were biased in treating the Rohingya compared to other ethnic groups. President Thein Sein backed the protesters and asked the MSF to leave. Unfortunately, thousands of preventable deaths have occurred in the Rakhine state as a result of limited health care access. 2012 statistics also suggest the government’s low concern for health care in Rakhine, as it has a 244 per 1,000 mortality rate compared to Myanmar’s overall rate of 55. Since the state refuses to grant the Rohingya citizenship, the United Nations needs to push the government into doing so. Although not all problems will be solved, as hostility towards the Rohingya is entrenched in society, citizenship will clearly alleviate the human condition of the Rohingya. 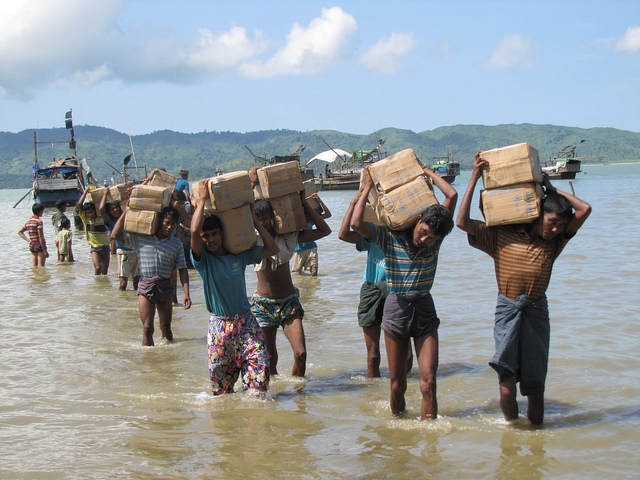 In times of conflict they would be able to more easily leave the Rakhine borders, they could access higher education, and they could legally get married and have children who would also be born with civil rights and a higher chance of leading a healthier life and getting out of the poverty trap that the lack of education upholds for the Rohingya. Although the United Nations only usually imposes sanctions on a country when the government is clearly and violently engaging in widespread human rights abuses against its civilians, the United Nations has a duty to prevent abuses in nationas, such as a genocide, when there are obvious warning signs. The UN’s “Framework of Analysis for Atrocity Crimes” stipulates warning signs of future genocide, and tools for its prevention. Under their framework, numerous “warning signs” are there. Risk factor number 12 for potential ethnic conflict is when “official documents…or organizational plan or policy to target civilian populations or protected groups is directly revealed, or could be inferred”. This is clear since the repression of Rohingya has been institutionalized in the 1982 Citizenship Law. Warning signs 11.1, “signs of patterns of violence against civilian populations”, and 11.2, “establishment of… military structures that could be used to commit violent acts” has also been clear when Myanmar security forces also commited “violent acts” against the Rohingya. Many people, in fact, have been referring to the Rohingya’s situation as already genocide. Based on the government’s and security forces’ repression of Rohingya, their minimal human and civil rights, and on their “Framework of Analysis for Atrocity Crimes”, shouldn’t the UN be pushing further for their citizenship before their situation worsens? In the Rohingya case, the credibility of the UN diminished as it hasn’t held the Myanmar government accountable for the international laws and treaties it has undermined. For example, the “1961 Convention on the Reduction of Statelessness” is described by the UN as the “primary international legal instrument” that deals with avoiding statelessness, and was brought “into force” in 1975. Article 9 of the convention claims, “a Contracting State may not deprive any person or group of persons of their nationality on racial, ethnic, religious or political grounds” (12). Yet, the Myanmar government has been doing just that as it is has been depriving the Rohingya of citizenship because of their ethnicity and religion. Myanmar also agreed in the UN-led 1994 International Conference on Population and Development (ICDP) that it would “focus on individuals’ needs and rights, rather than on achieveing demographic targets”. Once again, this was also undercut as the government prioritizes “achieving demographic targets” through aspirations of a mainly Buddhist state, rather than the human rights and the conditions of all the individuals living in its territory. By not holding Myanmar accountable to their clear violation of international treaties and agreements, the effectiveness of such instruments comes into question. Further, the role of the United Nations also comes into question. Isn’t the United Nations supposed to be the most powerful body with the ability to alleviate human rights abuses? The United Nation’s inability to get the government to offer citizenship to the Rohingya for over thirty years puts into question to what extent they really care about the promotion of human rights. Yet, it also seems that major actors, like the US, are for the Rohingya getting citizenship. For example, in November Obama told president Thein that discriminating the Rohingya works against their democratic transition. But such efforts will not suffice. It seems that for over the past thirty years, other countries have not put enough pressure on the United Nations and Myanmar to actually bring about citizenship and justice for the Rohingya. In essence, the condition of the Rohingya is deteriorating and it only seems to be getting worse. Babies being born into the status of “stateless” have been growing at an alarming rate in Myanmar, at what the United Nations Refugee Agency (UNHCR) estimated from a population of 850,000 in 2013, to 1,000,000 in 2014. This means more and more people are being born into a status where they have no civil rights and have slim chances to escape the poverty that has been imposed on them. There are no excuses for no one doing anything about this – there are clear signs of human rights abuses in a very large population. The United Nations needs to takes its goal of “promoting human rights” more seriously, and get the Rohingya the citizenship and the dignity they deserve. Human Rights Watch.”Burma: Government Forces Targeting Rohingya Muslims”. N.p., 1 Aug. 2012. Web. 17 Nov. 2014. 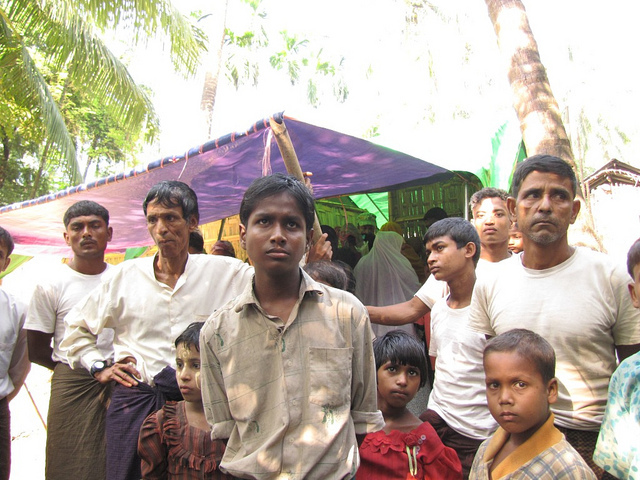 <http://www.hrw.org/news/2012/07/31/burma- government-forces-targeting-rohingya-muslims-0>. Dewa, Chris. “Issues to Be Raised concerning the Situation of Stateless Rohingya Children in Myanmar.” The Arakan Project (n.d.): 1-37. National Endowment for Democracy, USA. Web. 17 Nov. 2014. <http://www.burmalibrary.org/docs12/AP-CRCMyanmar-12- 01.pdf>. UNICEF. “Statistics: Republic of the Union of Myanmar.” UNICEF. United Nations, n.d. Web. 17 Nov 2014. <http://www.unicef.org/infobycountry/myanmar_statistics.html>. UNOGPRP: United Nations Office on Genocide Prevention and the Responsibility to Protect. “A Framework of Analysis of Atrocity Crimes: A Tool for Prevention.” 8.3 (1976): 1- 31. United Nations. Web. 17 Nov. 2014. <http://www.un.org/en/preventgenocide/adviser/pdf/framework%20of%20analysi s%20for%20atrocity%20crimes_en.pdf>. Nicki is a U1 student studying Joint Honours in International Development and Middle East Studies. She enjoys writing about repressed minorities, politics, and development in the Middle East.